Also Recommended: Galaxy Angel. What else were you expecting me to say? Notes: Anime adaption of Galaxy Angel II, the sequel to the 2001 Galaxy Angel originally created by Kanan. This is part of a merchandising line that also includes a manga, video games, and this TV series. Five new girls, also called the Galaxy Angels, go around searching for Lost Technology much like their predecessors did. Pardon my language, but being a big fan of the original Galaxy Angel franchise, I was hoping for Galaxy Angel Rune to offer up another season of five spunky young ladies going on all sorts of wild misadventures. Unfortunately, director Seiji Kishi and his crew got nothing except the "five ladies" concept right. In Kishi's defense, these new girls do not hold a candle to the original 2001 crew. Whereas the original series' cast were tweaked quite a bit by MadHouse, often exaggerating their interests or personalities (and even adding new ones) for the better, the Rune cast try to follow their video game counterparts while also attempting to be funny. It's like asking someone who writes for the Wall Street Journal to write an episode of SpongeBob SquarePants. It's just as disastrous as it sounds. Let's go down the new Angel Troupe girls. First up is Apricot, the heroine and little sister of original series lead Milefuelle. Much like her older sister, she is bound to strokes of fantastic luck at times. But she also has another "funny" trait; she goes berserk if a man touches her, causing explosions in her wake as she throws the guys who touch her into the distance. Not cute or funny in any way, Kishi. Yawn. Next we have Nano-Nano Pudding, an annoying cat-girl robot who I swear got lost on her way to a bad Di Gi Charat episode. In addition to being annoying and stupid, she also ends all her sentences with "no da", and the writers love to exploit her "cuteness" as much as possible. In third we have Kahula, voiced by the wasted Aya Hirano. Normally she's shy, friendly, and womanly until she drinks, when she becomes a devious flirt, her hair turns purple, her breasts reach gag size, and even has a different name; Tequila (bad pun, I know). One of the running gags in the series is how Tequila likes to flirt with the 14 year old Apricot. Huzzah. In room number four we have Lily, the leader of the group who modeled her hair after Troy from Gundam Wing. She's the serious, no taking crap leader of the bunch, only breaking out of the mold when the story tells her to. Whee. Lastly we have Anise Azeat, a tomboy treasure hunter and the series' only remotely clever, funny character. She only has the series' only vaguely funny running gag; she humorously owes quite a debt to Galaxy Angel's Mint, unaware of the fact that every time she breaks something on her journey, Mint simply adds it to her bill while she cackles. I applaud Anise's voice actress Satomi Hanamura for actually stomaching her way through the other characters' awful dialogue as she attempts to be funny. I imagine that was a difficult task. There's not much to say about the supporting cast, honestly. We have the girl's gay landlord (I'm not joking), a clone of Miss Bellum from Powerpuff Girls (their higher-in-command), and an annoying cat-head robot that looks like a lobotomized Luna from Sailor Moon. They're only memorable in the slightest because of how obnoxious they are. There's also one more girl, who I'll talk about in further detail below. 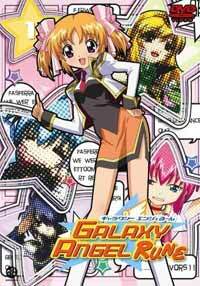 Similar to the original franchise, Galaxy Angel Rune often does parodies of various movies and anime. The highlights of the series include an amusing but short short Gunbuster parody and a whole episode that's a take on horror movies. There's even a few funny stabs at Broccoli's own Di Gi Charat, which I'll always appreciate. For the most part, though, Galaxy Angel Rune mainly sticks to its "own" material, which is usually awful. The nadir is an episode that has Apricot and Nano-Nano Pudding babysitting an annoying princess who rules over a bunch of high-pitched, irritating, ugly egg people for 23 minutes. Fun. And for further "fun", this brat makes several more appearances during the series' run, which means you have to hear the obnoxious egg people several times more. Speaking of 23 minute episodes, that's another problem with Galaxy Angel Rune; the pacing is awful. It does the same thing as the original To-LOVE-ru TV series, in that they have enough amsing material for 11 minutes, but add terrible jokes to fill up 12 more. This leads to a lot of recycled gags, ideas, and animation even in the same episode! There's not enough variety in the heroines or in their misadventures to compensate, either. There's also an episode in which the cast of both Galaxy Angel franchises meet, but it's as big a disappointment as the Road Runner / Speedy Gonzales cartoon The Big Chase that Warner Bros. made in the mid-60's. The original girls may look and sound like the original troupe, but they're barely funny at all. (Though seeing Chitose working an office job was pretty funny.) It is nice to see the original girls again, but only those nostalgic (and very forgiving) will care. As if its bad characters and terrible stories aren't enough, Galaxy Angel Rune also has horrible art and deplorable animation. Characters go off-model all the time, backgrounds are washed-out and dull, and there's tons of recycled animation. Not to mention the character designs, which range from generic (Anise, Apricot) to terrible (Nano-Nano Pudding). Even in comparison to other badly animated digital series it looks bad, killing off quickly what little there could be called a saving grace in this series (because its characters sure aren't!). The music fares little better, trying way too hard to mimic Galaxy Angel's soundtrack. And unlike the original series' cute, inoffensive bubblegum J-POP, Rune's OP/ED are an agonizing pain on both the eyes and ears. Push that forward button when these come up on your DVD and never look back. Even the official R1 DVD release has problems. The white subtitles are small and very difficult to read. It would've been fine if they stuck the subtitles to the bottom of the screen in the black borders, but instead they're raised above the black screens to blend right into the episodes, making them at times nearly impossible to read. The video quality also looks terrible for some reason. It's as if HONNEAMISE knew the series wasn't worth the effort to obtain better masters of, and I honestly can't blame them. The extras are lackluster, the only noticeable ones being live-action shorts featuring the 5 individual actresses of Galaxy Angel Rune in unrelated skits about love, school, and general waxing on of life. I actually started to miss the Ryoko Shintani live-action skits from the original series' first two seasons, as dumb as they were. Galaxy Angel Rune is an unfunny, stupid, annoying series that does little more than drag the original Galaxy Angel's name in the mud. All of the quirky, fun hi-jinx of the original series have been tossed aside for lame characters and boring stories. Despite a couple of decent episodes and the rare funny joke, most of this is more a test of endurance and patience than anything that could be considered entertainment. What a sad ending to an otherwise great comedy series. Recommended Audience: For teens and up, due to fan service, suggestive themes (Tequila's flirting with a underage teenage girl), and slapstick.